Probate | Ormond Beach, FL Estate Planning Lawyer Randal L. Schecter, P.A. Contact The Villages, Florida Probate Attorney Randal L. Schecter, P.A. Probate is the legal process by which a Court appoints a Personal Representative to pay a deceased person’s valid bills and distribute the remaining assets to the deceased person’s heirs. Probate can be necessary if the deceased person died with a Will or even without a Will. Mr. Schecter will walk you through the probate process step by step. 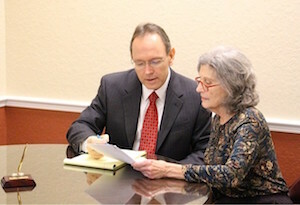 He will assist you in gathering the probate assets and notifying the creditors of the estate. He will also help you pay debts of the estate and transfer the property to the beneficiaries of the estate at the appropriate time. When Mr. Schecter meets with clients for estate planning, one of his primary goals is to avoid Probate. Probate can be expensive, intrusive and very stressful for the family involved. The average formal Probate takes from 9 months to 1 year even when there are no disagreements between family members. Probate can be avoided with careful review of your assets and proper planning. Mr. Schecter will discuss your options regarding how to avoid Probate and when it would be appropriate to use Revocable Trusts, Irrevocable Trusts, Co-ownership of assets or Life Estate Deeds.